Wellness exams keep your cat as healthy as possible! Cats age faster than people, so regular wellness exams, combined with your observations at home, are important to detect potential health problems early. To assure a longer and highest quality of life for your cat, bring your cat to us for a wellness exam at least every six months. We assess your cat’s breed, environment, lifestyle, age and medical history to determine what is best for his or her continued good health. Your cat’s wellness exam is an opportunity for us to discuss any concerns you have about your cat’s health. 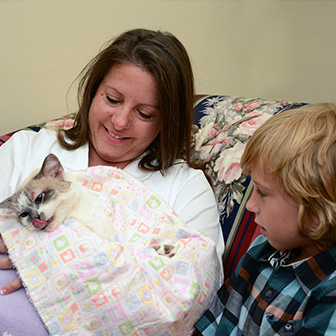 At Iowa Veterinary Wellness Center, all aspects of your cat’s health and wellness are encouraged discussions. Topics ranging from nutrition, allergies, bad breath, mobility issues, risk of infections and any lifestyle and age related changes are all important discussions to keep your cat healthy. Our knowledge and expertise are at your disposal during your pet’s wellness exam. A comprehensive physical examination of your pet that includes a cardiovascular check, pulmonary/lung check, dental and body/muscle assessment, as well as an evaluation of your pet’s coat, skin, eyes and ears, nose and throat. Vaccines tailored specifically for your cat. Cats are susceptible to a number of internal parasitic infections, several of which are able to infect people in addition to animals. Therefore, parasite prevention is not only important for the health of your pet, but also for the health of your family. During your cat’s wellness exam, we may suggest a professional dental cleaning for your cat. For more information about Iowa Veterinary Wellness Center’s dentistry services, please visit our dental care page. For details about Iowa Veterinary Wellness Center’s nutrition and diet counseling, please visit our nutrition and diet page. In addition to an annual wellness exam, vaccinations, flea and tick control, and dental exams, your cat may benefit from herbal medicines or nutritional supplements, acupuncture, chiropractic care, or therapeutic laser treatments. If you have any questions about these treatments or whether your cat would benefit from them, please discuss them with us during your pet’s exam.